Once upon a time, doll artist Paulette Goodreau (far left) of Goodreau Doll opened her e-mail, and her world was turned upside down. Like Lewis Carroll’s Alice, who suddenly found herself spiraling down a rabbit hole, Goodreau discovered that she, too, was about to embark on a journey into Wonderland and beyond! With a click of her computer mouse, Goodreau was immediately plunged into the backstage drama of “Tea Party,” a song and video, conceived by recording star Kerli, which was tied into the Tim Burton Alice in Wonderland treatment. Much of Goodreau’s participation was left up in the air, and that is exactly where the imaginative artist found herself. She was winging her way to Burbank, Calif., accompanied by 20 of her custom-made dolls. Anticipation and exhilaration went hand-in-hand during Goodreau’s time on the set. She was thrilled to be there and constantly challenged to help make Kerli and her crew’s visions come true. For more information, visit www.goodreaudoll.com and www. kerlimusic.com. Tim Burton’s long-anticipated version of Alice in Wonderland had been causing an Internet buzz from the moment it was first announced. When it was confirmed, and photos and details were made public, the online communities went gaga for the CGI-three-dimensional extravaganza. Kerli and Paulette Goodreau participated in the special-effects world for the “Tea Party” video, which debuted online in March. Directed by Justin Harder, the video is based on a treatment written by Kerli, along with her best friend. “I’m obsessed with dolls and, once more, this video shows it,” Kerli shares. The petite powerhouse that is known as Kerli (just one name, like Madonna and Fabian) is an alternative-music sensation and composer who is lauded for her brains and her beauty. Born in Estonia, the 23-year-old has the flaxen good looks of a young Britt Ekland and the singing/writing chops of Patti Smith. It’s quite a compelling combination. Just like her forerunner Debbie Harry of Blondie, Kerli’s very astute and ironic sensibilities are at the root of her success and her appeal. Kerli gained enormous recognition for her 2008 album Love Is Dead, and particularly for the song “Walking on Air” and its accompanying video. In that mini movie, Kerli leads viewers into a mystical and darkly magical world where dolls and humans eerily blend. The visual effects are seamless and surreal. The constant mantra in that song is the word “creepy,” and the video manages to be that and so much more. These days, the L.A. resident is extremely busy—touring for the Almost Alice compilation, taking part in photo shoots and looking for ideas for her next album—but she found time to chat with DOLLS magazine while she was on the road in Europe. 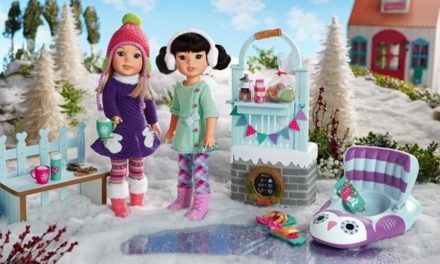 DOLLS: Are you a doll collector? Kerli: I’m not collecting yet, but I’m gonna get into it the very moment I have some money left over from buying keyboards! I’ve actually already picked out some critter parts I really want, and I’m absolutely in love with the BJDs (ball-jointed dolls). They are truly an art form. I’m so glad to get to know Paulette through these dolls as well. Her art, but mostly her kindness, inspires me a lot. 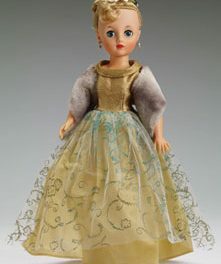 DOLLS: When you were a child, did you have a favorite doll or toy? Kerli: I was a huge “Barbie” fan, of course. But I had this one very special toy that my dad got me for my sixth birthday. It was like a real-size baby doll that peed and pooped. I lost it in the forest, and when someone found it a couple of years later, I felt so much happiness. It was as if I had found my lost child. DOLLS: You’ve been creative and theatrical your whole life. Did that spill over to your doll playing? Kerli: Well, I was convinced that my toys came alive at night, so sometimes I’d stay up and pretend I was sleeping. I even threatened them so they’d open up to me. Very strange, right? 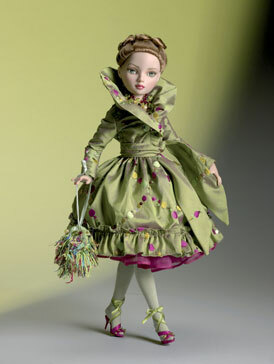 DOLLS: Did you read Alice’s Adventures in Wonderland as a child? Were you familiar with Alice as a kid? Or did you discover her as an adult? Kerli: Alice is kind of new to me, actually. I don’t recall knowing anything about Alice when I was little. I had different books in my house—Eastern European fairytales—they still really affect the way I create. I discovered Alice only a couple of years ago and fell in love. Now that Tim is doing his version of the movie, I’m sure I’ll love Alice even more. DOLLS: How did you become involved with the Almost Alice album? Did you write the songs for it, or are you singing someone else’s composition? Or both?